The tools that cold milling machines use for removing road layers were originally developed for the mining industry. So-called point-attack cutting tools, fitted to a rotating milling drum on the underside of the machine, bite into the road at precisely the specified depth. No material is too hard for these tools: Cold milling machines are even capable of rehabilitating concrete pavements. Whether asphalt or concrete: The material is milled and then directly loaded on trucks to be transported from site, all in one single pass. Excellent lighting systems enable night operations to be concluded swiftly. Front loaders can fill large loading spaces completely thanks to the variable discharge parabola. When pavements need to be replaced, cold milling machines remove the damaged courses. Removal of up to 35-cm-deep asphalt pavements. The large milling machine works through the pavement at a high advance speed. Because traffic is often slow-moving in the area of the job site, car drivers mock the massive cold milling machines by saying that they’re always first in the traffic jam. Few bear in mind, however, that rehabilitation projects using cold milling machines are mostly carried out as mobile roadworks. Alternative methods would involve a much greater effort. Cold milling of road pavements is unrivalled in terms of both logistics and speed of execution. Not all cold milling machines are as big as a whole apartment. Some models are as small as a passenger car. 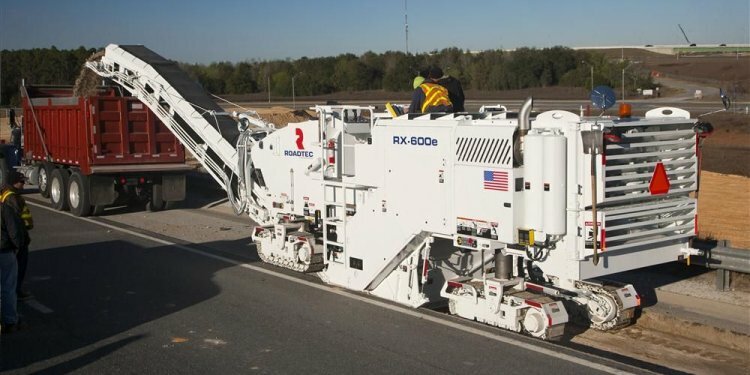 On many job sites, machines of different sizes frequently work as a team, each one playing its own aces: The large milling machine removes the large surfaces, while the small one takes care of milling off the pavement around “nuisances”, such as manhole covers or kerbstones. The manhole cover is milled around neatly and quickly in a single pass. When the supporting wheel is folded in, the surface course can be milled off right up to the curb. Economical rehabilitation of medium-sized surfaces, even when working in extremely cramped conditions. Typical of rehabilitation methods using cold milling is that the damaged pavement layers are usually replaced with asphalt – irrespective of whether the distressed pavement consisted of asphalt or concrete. The new surface course or asphalt road structure is paved by road pavers prior to conventional compaction by rollers.